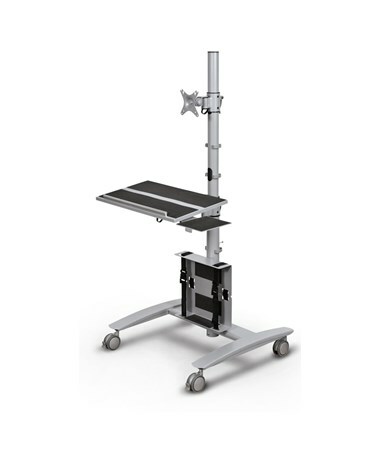 The 27614 Mooreco Beta Sit-Stand Work Station is a versatile mobile work station with the highest of quality and design. The Beta Cart provides comfort and efficiency to its user. Choose a sitting or standing position at your leisure.Mobile flexibility allows for easy moving through small doorways and over thresholds for presentations and meetings. 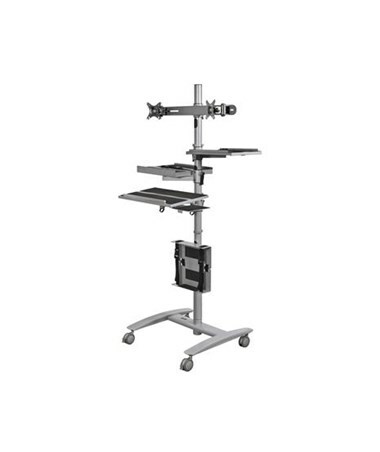 The center post of the Beta Work Station works as a hub for accessory shelves, monitor mounts, and CPU holder, each independently height adjustable. 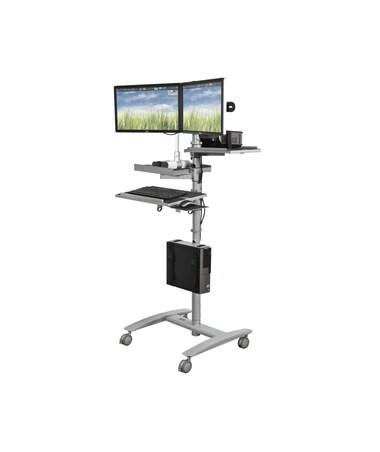 The base model includes a single monitor mount, CPU holder with two clamps for a secure hold, and laptop/keyboard shelf with a mouse platform. The monitor mount holds a LCD display monitor up to 22". The mount allows up to 35 of tilt, and 25 of pan adjustment. Added conveniences of the Beta Work Station is cord clips for cord management and non-slip EVA pads on all shelves. 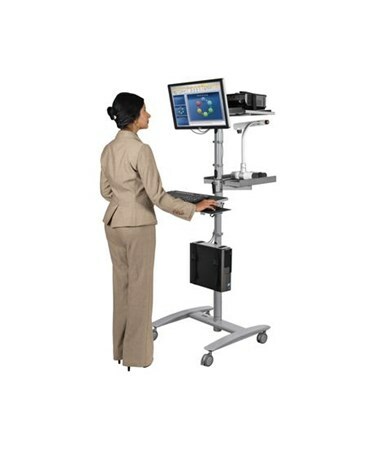 We offer the Beta Sit-Stand Work Station with three optional upgrades. Choose from these three enhancements from the drop down menu above. Laptop/keyboard shelf - 18 3/4" x 13 3/4"
Mouse platform - 6 1/4" x 6 3/4"
CPU holder adjusts in width from approximately 6" to 10"
Optional projector shelf - 15" x 11"
Optional document camera shelf - 15" x 13 3/4"
Optional dual monitor mount holder accommodates two monitors up to 22". Allows up to 35 of tilt, and 25 of pan adjustment. Handy knobs adjust the space between monitors. 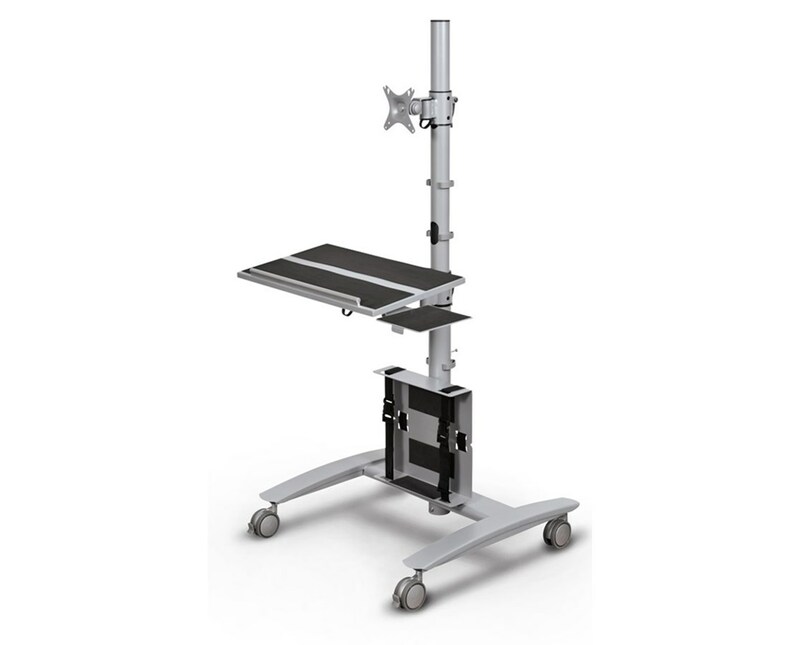 The 27614 Mooreco Beta Sit-Stand Work Station comes with a 1 year limited manufacturer warranty. 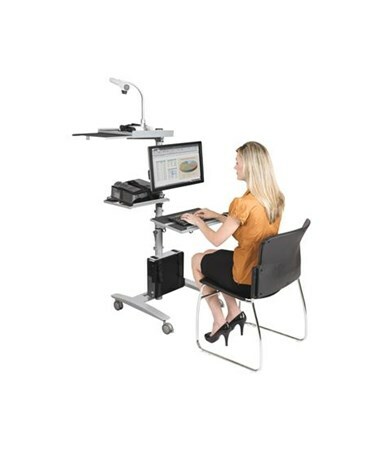 Improves your energy and efficiency by standing or sitting as you work, and then switch positions whenever you choose. Connect your CPU or your laptop with a LCD display or upgrade to the dual-display configuration. 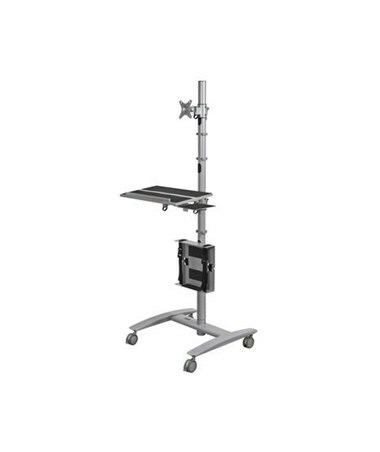 Center post works as a hub for accessory shelves, monitor mounts, and CPU holder, each independently height adjustable. Cable management clips keep cords under control. Includes single monitor mount for a monitor up to 22". Allows up to 35 of tilt, and 25 of pan adjustment. Includes angled laptop/keyboard shelf with a mouse platform that swivels beneath when not in use. Included CPU holder has two clamps, holding securely. Adjusts in width from approximately 6" to 10". Optional shelf for projector and document camera available. Optional dual monitor mount holder available.